Money Banks Pottery is part of Muggins Pottery, based in Leicestershire in the UK, south of Nottingham and near the village of Cotes. We pride ourselves in making quality pottery to our own unique and individual designs. For a really special gift, names can be added. We source entirely local materials and import nothing - everything is hand-made in our studios in Leicestershire. 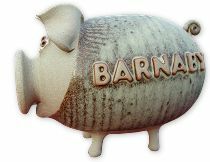 True English Pottery. Tour our website, and if you can't locate what you are looking for, contact us. To call on our parent pottery, visit the unique Muggins Pottery website.